There has been a lot of progress over recent years in regards to braces technology. Lingual braces which sit on the backs of the teeth, are proving to be very popular for people with concerns about the appearance of traditional braces. 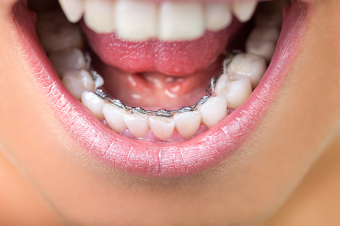 Lingual braces are similar to traditional metal braces but are hidden from view since they are placed on the backs of the teeth instead of the fronts. This means that lingual braces are virtually invisible to other people, and that's one reason for their popularity. Another advantage of lingual braces is that if you play a sport or a wind instrument, lingual braces can adapt to it more readily than traditional braces. Lingual braces tend to cost more than traditional braces, and can cause treatment to take a little longer, but for many people the improved aesthetics are worth the additional cost and time. There are some challenges associated with them that aren't an issue with traditional braces. People with severe bite problems cannot wear lingual braces. Also, the teeth have to be long enough, so that there’s space to glue the braces on the inside of the teeth. Lingual braces can sometimes pose a problem for your tongue, which will be in constant contact with these sharp metal objects. Significant irritation as your mouth grows accustomed to its new resident is common. Lingual braces will also require some reconditioning of the tongue thrust that you automatically perform when you swallow. Difficulty speaking is not unusual when lingual braces are first applied, so this might also be a factor to take into consideration. If you are interested in learning more about lingual braces, please contact our BC Orthodontists today.